Another grey but dry morning greeted us in Tomales but this time those conditions seemed to persist. The cooler conditions seemed ideal for walking, though; it was time to make use of the walking map and guide book that we had bought yesterday. We packed a lunch and pointed Softly Spoken Sue , the alter-ego for the car’s navigation system, at Bear Valley Visitor Center (giving it the American spelling since that where it is) just south of Point Reyes Station. About five miles down the road beside Tomales Bay the sky cleared to my very favourite colour: unadulterated blue. We were beginning to spot a pattern, here. Tomales is usually shrouded in what must be higher-level fog but surrounding areas may be clear. Conditions were clearly not going to be as cool as we thought but I’ll take a fabulous day any way I can get it. Muggins managed to miss the final right turn towards the visitor centre. Softly Spoken Sue calmly told me to, “make a legal U-turn ahead” and retrace my steps. Getting it right second time around, after about another mile we were soon parking at our destination, the head of several “hiking trails” (in Amerispeak) that explore the coastal range beside Drake’s Bay. 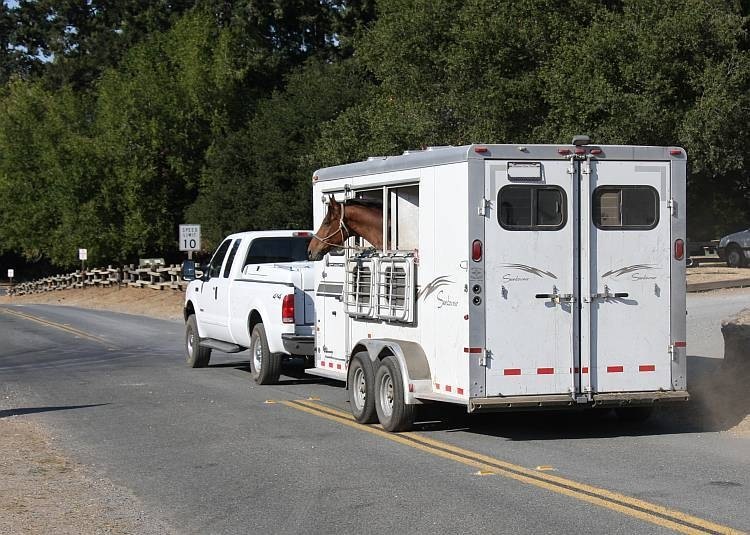 The trails are shared with horses and a special parking area for horse-boxes is provided and was being well used. The horse boxes are a very different design to those used in England, with flaps that open along their side. Open a side window in a car that contains a dog and the dog sticks it head out into the air flow and looks forward. Open a flap on a horse box containing a horse and the horse pretends it’s a dog and sticks its head out into the air flow and looks forward. We’d like to do the same thing but our signs above train windows forbid it. Darn! As well as the longer trails there is a 0.7 mile paved wander to get up close and personal with the San Andreas fault line. Lunchtime was approaching so we decided to use this as a limbering-up exercise before refuelling on our lamb sandwiches prior to attacking something a little more serious. There is a series of blue posts placed to mark the fault line itself. At one point, these posts march through a dislocated fence. The hapless fence lined up until the San Francisco earthquake of 1906 caused one part of it to march north by about 18 feet. We expected to see obvious earth disturbance but oddly, none seems to be in evidence, just a fence that’s no longer linked. To reduce our calorie footprint after lunch, we chose a circuit 2 miles up Mount Wittenberg Trail to the highest point here at about 1400 feet, a mile along the ridge on Sky Trail, then 2 miles back down Old Pine Trail before returning the 1.5 miles to base on Bear Valley Trail. 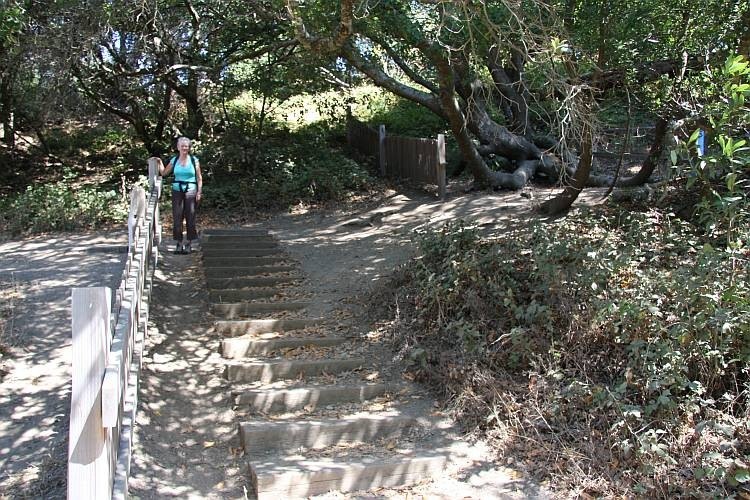 The lower levels of the trails were very dry and dusty but, since the ridge is, as we’ve seen, frequently shrouded in the coastal fog, the upper levels were damp and quite boggy in places. 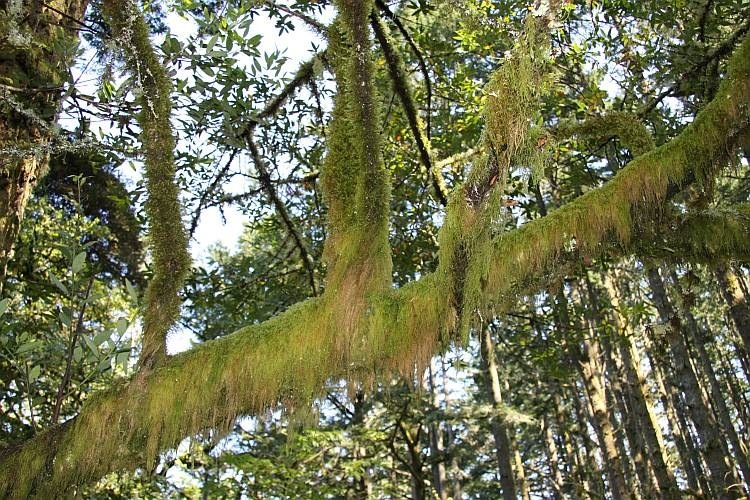 Moss-covered tree trunks and branches bore witness to the frequently damp conditions. Drake’s Bay beneath us was still very foggy. We noticed disturbingly regular over flights by the ubiquitous turkey vultures. Could they be keeping an eye on us, waiting for a potential late lunch to succumb? Fortunately, we foiled them and completed our circuit, albeit with an aching joint or two. We are clearly out of practice. Back home in still foggy Tomales, the first Anchor Steam lasted about 30 seconds. I could put forth another theory about the cause of the aching joints and it has nothing to do with practice and more to do with experience.